How do I create a file link in a page in a group? 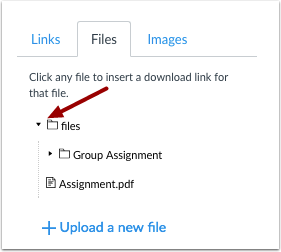 In groups, you can add a file to a page. 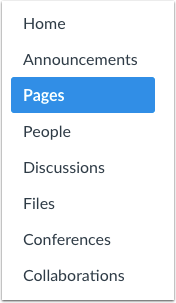 In Group Navigation, click the Pages link. Pages is designed to open to the front page for a group, if there is a front page selected. Click the View All Pages button to select a page from the Pages Index. Click the title of the page you want to edit. In the Content Selector, click the Files tab. Click the files folder. If there is a subfolder, the course files folder will expand. 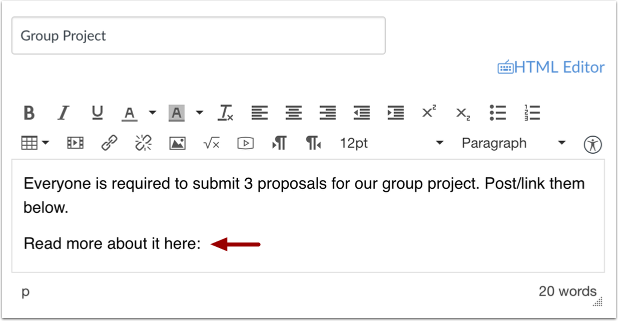 In the Rich Content Editor, place your cursor where you wish to insert your file. In the Content Selector, click the name of the file you want to insert into the Rich Content Editor . 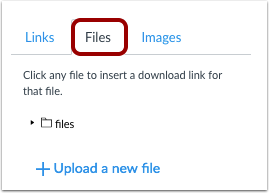 The name of the file will appear in the Rich Content Editor in blue text , indicating that the link is downloadable. Previous Topic:How do I embed a video in a page in a group? Next Topic:How do I view the history of a page in a group? Table of Contents > Pages > How do I create a file link in a page in a group?